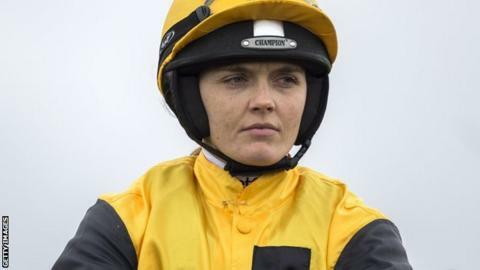 Victoria Pendleton has been lined up to compete on a leading contender at the Cheltenham Festival. The former cycling champion aims to ride in the Foxhunter Chase for amateur jockeys on Gold Cup day on 18 March. Racehorse owner Andy Stewart has made Aintree Foxhunter runner-up Pacha Du Polder available for her to ride for the rest of the season. Pendleton, 35, completed her first point-to-point race over jumps when finishing fourth in a race on Sunday. Pacha Du Polder, a nine-year-old gelding, is trained by Chloe Roddick in Somerset. "It's great that an owner of Andy's stature is putting his faith in me to ride one of his horses," Pendleton said. She is looking to go from complete novice to riding at jump racing's showpiece fixture in the space of a year. The leap from finishing fourth in a point-to-point to lining up at jump racing's showpiece event - albeit in a race for amateur riders, so no Ruby Walsh or Richard Johnson - is enormous, but Pacha Du Polder will be a sure-footed ally in that quest. He was a very honourable runner-up in Aintree's similar race, staged over the Grand National fences, in 2015. So this news is a significant boost for Pendleton's ambitions, and for racing which is relishing the prospect of a real headline-grabbing story.